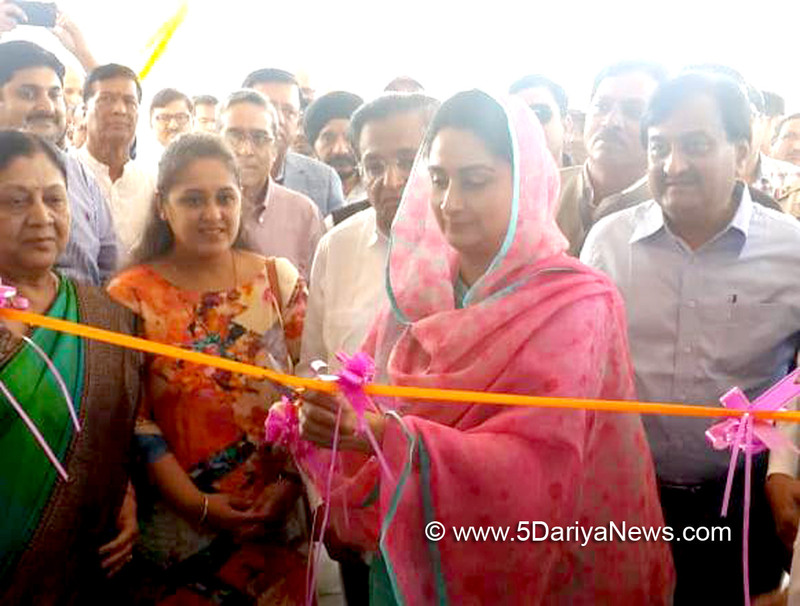 Union Minister for Food Processing Industries Harsimrat Kaur Badal today inaugurated the second Mega Food Park in Maharashtra. Promoted by M/s Paithan Mega Food Park Pvt Ltd, the Park is located in in Wahegaon and Dhangaon village in Paithan Taluka of Aurangabad district. A 3rd Mega Food Park has been sanctioned by the Ministry in Maharashtra and is under implementation in Wardha District while the first Park was inaugurated on 1st of March 2018 in Satara district.The Paithan Mega Food Park Park has been set up in 102 acre of land at a cost of Rs. 124.52 crore. The facilities created by the developer at Central Processing Centre (CPC) of this Mega Food Park include Dry Warehouse of 10,000 MT, Cold storage of 1,000 MT, Pre-cooling facility of 10 MT, Ripening chambers of 400 MT, IQF Facility of 1.5 MTPH, Freezer room of 1,000 MT, 5 MTPH Juice Line with 1.5 MTPH of Aseptic packaging Line,Steam sterilisation and generation unit of 4 MTPH, Food Testing lab, Reefer vans of 30 MT and Milk Tankers of 50 MT, Milk Processing facility of 1,00,000 LPD with Bulk Milk Chilling of 20,000 Liter and other food processing facilities.The Park also has a common Administrative building for office and other uses by the entrepreneurs and 3 PPCs at Paithan, Alephata and Kannad having facilities for primary processing and storage near the farms.This Mega Food Park will benefit the people of Aurangabad District as well as nearby Districts of Nasik, Dhule, Jalgaon, Buldhana, Jalna, Bid and Ahmednagar. Speaking on the occasion, Smt. Badal said that the Mega Food Park will leverage an additional investment of about Rs. 250 crore in 25-30 food processing units in the park and would eventually lead to a turnover of about Rs. 450-500 crore annually. The Park will also provide direct and indirect employment to 5,000 persons and benefit about 25,000 farmers in the CPC and PPC catchment areas.The Minister added that the modern infrastructure for food processing created at Park will benefit the farmers, growers, processors and consumers of Maharashtra and adjoining areas immensely and prove to be a big boost to the growth of the food processing sector in the State of Maharashtra.Smt. Badal also said that the government is fully committed to providing an environment that is smooth, transparent and easy for investors wanting to start an enterprise in India and in a bid to make India a resilient food economy and the Food Factory of the World, the government has made Food Processing a major thrust area of ‘Make in India’. Smt. Harsimrat Badal thanked the Chief Minister and the State Government for the support extended by them in setting up the Mega Food Park.Ministry of Food Processing Industries is focussed on boosting the food processing industry in India so that agriculture sector grows exponentially and becomes a major contributor to doubling the farmers’ income and to contribute to ‘Make In India’ initiative of the government.Aimed at giving a major boost to the food processing sector by adding value and reducing food wastage at each stage of the supply chain with particular focus on perishables, Ministry of Food Processing Industries is implementing Mega Food Park Scheme in the country. Mega Food Parks create modern infrastructure facilities for food processing along the value chain from farm to market with strong forward and backward linkages through a cluster based approach. Common facilities and enabling infrastructure is created at Central Processing Centre and facilities for primary processing and storage is created near the farm in the form of Primary Processing Centers (PPCs) and Collection Centers (CCs). Under the Scheme, Government of India provides financial assistance upto Rs. 50.00 Crore per Mega Food Park project. Restart Bathinda plant and ensure central funds spent on renovation at instance of SAD-BJP govt are not wasted - Harsimrat Kaur Badal tells CM Capt Amarinder Singh.